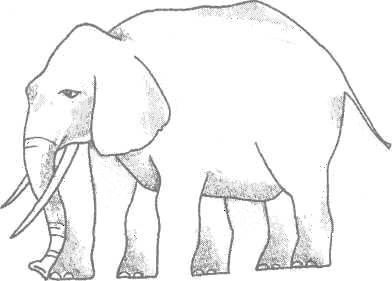 When you look quickly at this image, you'll see an elephant. It's only when you examine it closely that you see that things are not what they appear to be. When most people look at others they see the person, but they miss revealing details that are obvious when pointed out. And so it is with body language. Communication through body language has been going on for over a million years but has only been scientifically studied to any extent since the end of the twentieth century. Body language is finally being 'discovered' by people throughout the world and is now a part of formal education and business training everywhere. This final section is devoted to a mix of simple scenarios that will give you an opportunity to review how well you can now read body signals. You should find that your perceptiveness has markedly improved. Keep in mind that, while we are analyzing frozen gestures here, it all needs to be read in clusters of gestures, in context, and with allowances for cultural differences. How Well Can You Read Between the Lines? 1. What Are Three Signals? This is a good example of an openness cluster. The palms are fully exposed in the submissive position and the fingers are spread to give more impact to the gesture and to signal non-aggressiveness. His entire body is open showing that nothing is being concealed. This man is communicating an open, non-threatening attitude. 2. What Are Four Signals? This is a classic deceit cluster. 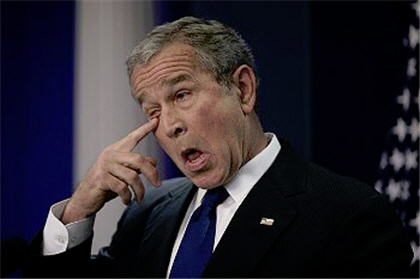 As President Bush rubs his eye at a press conference he looks away and both eyebrows are raised to the disbelief position. His head is turned away and slightly down, showing a negative attitude. 3. What Are Four Signals? This woman disapproves of the person at whom she's looking. She has not turned her body towards him but is giving him a sideways glance with her head slightly down (disapproval), eyebrows slightly turned down (anger), a full arm-cross gesture (defensive) and the corners of her mouth are turned down. 4. What Are Three Signals? Dominance, superiority and territoriality are evident here. 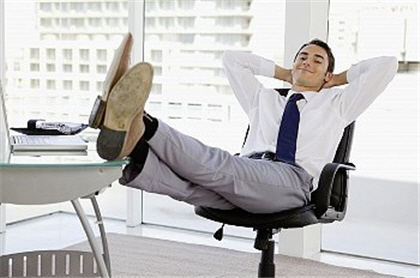 The Catapult shows a superior 'know-it-all' attitude and feet-on-desk shows a territorial claim to it. He is also sitting in the defensive/competitive position. 5. What Are Three Signals? 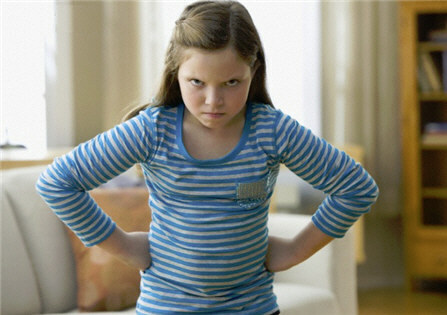 The hands-on-hips gesture is used by the child to make herself appear larger and more threatening. The head is tilted down with eyes looking upward in a power stare with narrowed eyelids, what animals often typically do just before they attack. 6. What Are Twelve Signals? To an outside observer these three business people might be trying to deal with a novel problem or challenge. Let's first evaluate the woman in the center of the picture facing forward. We will assume that the meeting is being held in her office given her proximity to the office desk and her position facing outward. One foot planted forward shows assertiveness, consistent with her having control. Her eyes look upward, typically a sign of visualizing in the mind's eye either past experiences or imagining a new reality, depending on whether is looking to the right or the left, respectively. The palm of one hand faces upward, welcoming and open to the others. In this instance she might be conveying possibilities for action or trying to elicit ideas from the others. The woman on left of the picture also has her foot forward indicating assertiveness. Along with having hands on her hips, this suggests an innate confidence. Her head too is tilted upward signaling contemplation. The man on right scratching his head indicates he feels a sense of doubt or uncertainty about what challenge or problem is at hand. He may be thinking about alternative approachs. His feet however are planted evenly and he has one hand on a hip, meaning he has a positive frame of mind about the outcome. 7. What Are Fourteen Signals? This guy's posture bespeaks casual confidence. He takes ownership of the space via a hand placed on the wall while the other hand is placed on his hip in a clear display of male assertiveness. His body is most directly pointed at the lady on the right side suggesting she is his primary interest at that moment. The standing crossing of a leg with toe touching the floor is an additional sign of ownership of space. The baseball-style cap turned sideways at a rakish angle in a sign of urban cool shows confidence with the situation at hand. The young lady in the center has her body angled away from him, a clear sign of disinterest or defensiveness. She looks over her shoulder in an sideways glance readily construed as apprehensiveness. Furthermore, her arms are crossed tightly suggesting defensive anxiety. The woman on the right appears conflicted in her body language, evaluating the situation and the guy. Her body is pointed away from the gentleman with her feet together in an Attention stance suggesting a neutral attitude, or ... signaling you'll have to work harder to impress me! The sideways glance may indicate possible interest, ... or uncertainty, consistent with the protective Partial Arm Cross. The open wrist with cigarette is a sexual display of potential interest while the woman's blowing of smoke upward demonstrates positive confidence. Her attitude could transition to a more receptive state if the young man plays his cards with finesse. Research has now shown convincingly that if you change your body language, you can change many things about your approach to life. You can alter your mood before going out, feel more confident at work, become more likeable and be more persuasive or convincing. When you change your body language you interact differently with people around you and they, in turn, will respond differently to you. When you first start increasing your awareness of body language you'll probably feel uncomfortable and self-conscious. You will be aware of practically every expression you make, surprised at how many gestures you make and how often you try to adjust them. Most people are completely unaware of what their bodies are doing at any given moment; they are busy enough trying to make an impression on you that they fail to consciously notice what you are doing. It may seem strange at first to consciously have your palms open and keep steady eye contact if you have spent your life keeping your hands in your pockets or holding hands with yourself and looking away. You may ask, 'How do I watch someone's body language while thinking about my own body language and trying to concentrate on what we're talking about?' Your brain is already programmed to read many body language signals so all you are doing is learning consciously to read the signals and messages. It's like riding a bicycle for the first time - it feels a little scary at the start and you might take an occasional tumble but before long you'll be riding like a pro. Some people may feel that learning body language skills is manipulative or insincere, but learning to be proficient at reading it and using it is no different to wearing certain types of clothes, using certain language or telling stories that put you in the best light. The difference here is that it will not happen unconsciously and you will make a better impression on others. If you are a man, remember that women are reading and decoding your body language whether you realize it or not, so learning how it's done can give you an equal footing. Without effective body language you can be like a spaghetti Western - the lips don't match the words and the viewers are constantly confused or switch channels. Finally, here is a summary of the keys points for making a positive body language impression on others. Face: Have an animated face and make smiling a part of your regular repertoire. Make sure you flash your teeth. Gestures: Be expressive but do not overdo it. Keep your fingers closed when you gesture, your hands below chin level and avoid arm or feet crossing. Head Movement: Use Triple Nods when talking and Head Tilt when listening. Keep your chin up. Eye Contact: Give the amount of eye contact that makes everyone feel comfortable. Unless looking at others is a cultural no-no, lookers gain more credibility than non-lookers. Posture: Lean forward when listening, stand straight when speaking. Territory: Stand as close as you feel comfortable. If the other person moves back, don't step forward again. Mirror: Subtly mirror the body language of others.